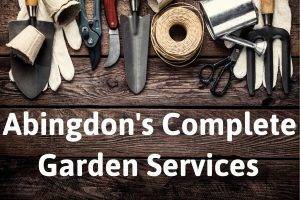 Abingdon’s Complete Garden Services are based in Oxfordshire, and specialise in all aspects of garden design and maintenance. For over 30 years, our family-run business has provided gardens in the Oxfordshire area with professional garden design services; we’re dedicated to helping you to get the garden of your dreams. Gardening is a slower process than the usual home improvements. It can take years for a garden to mature and show you its real beauty. We take this into consideration when undertaking garden design; thinking carefully about how the garden will mature over the coming seasons, we can create a garden that will give you years of enjoyment. Your garden design preferences are very personal to you; we specialise in designing a garden that you can be completely happy with and will help you to make the most of your outdoor spaces, whatever the season. A full garden design makeover by Abingdon’s Complete Garden Services is ideal if you are looking to make your mark on your property. One of the benefits of having a garden suited to your lifestyle is that it can create a seamless transition from your interior spaces to your exterior. For example, if you like to entertain guests and host parties at your home, we can create spaces with entertaining in mind with features such as pergolas and decking. On the other hand, you may be interested in creating an outdoor space that the whole family can enjoy – you can relax in comfort while the kids get some fresh air. Any combination of these options and more can be incorporated into your new garden design, and we’ll work closely with you to make sure your new garden is absolutely perfect. If you are interested in having a new garden designed by our experts, then give us a call or drop us a message. We offer free advice, quotes, and measurements, so you can get a good idea of what your new garden could look like, without spending a single penny. For an idea of what we can do, check out our gallery. Further to our complete garden redesign service, we also carry out garden maintenance, year round. Depending on what your garden includes, this could involve lawn maintenance, pruning, weeding, and plant bedding.